The Caucasian rugs get their name from the area in which they were made – the Caucasus. The Caucasus is a region that produces distinctive rugs since the dawn of civilization and in quantities from the 19th Century. The antique Caucasian rugs are primarily produced as village and tribal pieces rather than the fine and intricate city productions. 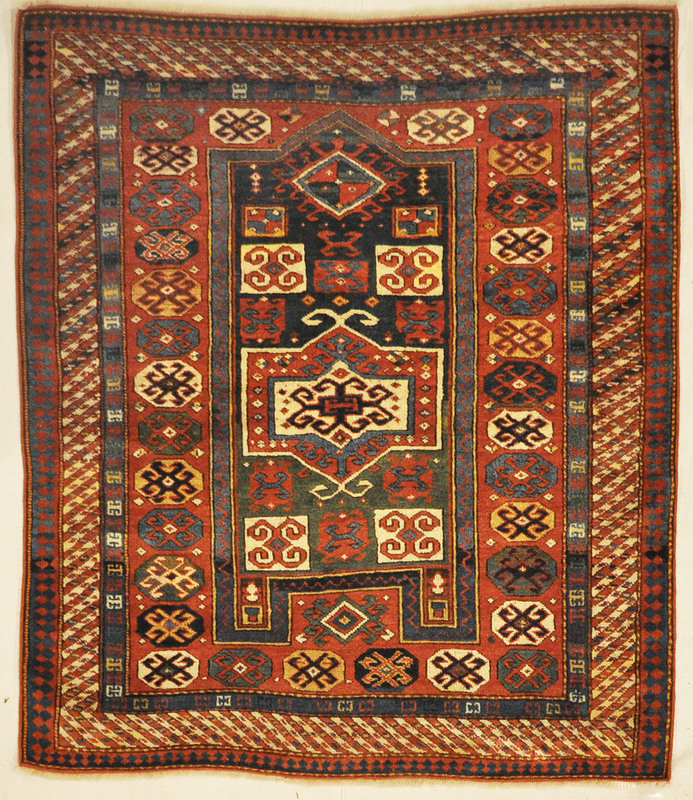 At one time it was assumed that all of the rugs in the Caucasus were woven by “Tribal” or “Nomadic” weavers. That if one bought a Lezgi Star Rug it was woven by a Lezgi weaver. Some even saw Schurmann’s classic Caucasian Carpets as a guide to the tribes of the Caucasus. Then a reversal came and it was suggested that virtually all Caucasian rugs were commercial and the patterns came from Russian Government (first Czarist then Communist) Kustar pattern books. In the 1820s the Czarist Russians divided Transcaucasia into the Russian provinces of Baku, Derbent, Sheki, Karabagh, Shirvan, Talysh, and Kuba. Riad: Caucasus. The Russians divided the region in the manner that was easiest for them to administrate and it did not necessarily follow an ethnographic approach in the division. The Czarist Russians began to solidify their hold as early as 1805 – 1820 but they did not truly control the region for many years. With the capture of the great rebel religious leader Shamyl in 1859 and the end of the rebellion in 1864 did Czarist control truly solidify regional control. In 1865 to eliminate risk of future rebellion the Russians forced 1.2 million Caucasians to move to Turkey. It is strongly suspected that areas such as Ngorno-Karabakh which were historically Muslim were depopulated and then repopulated with Armenians. As Christians, the Armenians had an easier time with the Orthodox Christian Russians. The word Kazak probably derives from the Russian for Cossack – originally Christian Russian and Ukrainian serfs who fled from feudal landlords, and were known as vicious warriors. The rugs from the Caucasus are primarily made of materials that are (or were) particular to their tribal provinces and some of the styles that are “typical” or better known to the Caucasus region are Shriven, Dagestan, Kuba, Kazak rugs. Most older Caucasian antique tribal carpets are “all wool” – not only the knotted pile, but the warp and weft threads are usually made from hand-spun woolen yarn or goat hair. However, one can sometimes find older antique carpets (and, more frequently, in some newer examples) with cotton warps and wefts. Shriven region Oriental Rugs are noted for their wool wrap threads, but are made with cotton weft threads and selvedges. Caucasian Rugs are probably the most widely collected type of antique rugs. The strongest market for Caucasian rugs has to be Italy who appreciates these rugs for their tribal and primitive designs complimenting the classical architecture and historic buildings. The colors of the best antique (100 years old or greater) Caucasian carpets were produced exclusively from natural materials found in the respective tribal regions, with the deep greens, vibrant yellows, and deep rose tones being the most precious. The distinguishing aspect of the Caucasian carpet is its emphasis on rich and varied color. The number and colors of selvedges often can be an identifier to the area of origin. The designs and colors of antique Caucasian rugs are unique for two reasons: tradition – more deeply rooted in Asia than anywhere else, and the inherent geographic isolation. Visual balance is achieved by contrasting wildly different colors, rather than the more traditional approach of shading similar hues. While Caucasian rugs tend to feature floral designs, their depiction is usually highly stylized, abstract, and geometric. One can see the evolution of tribal rug weaving in the history of antique Caucasian carpets. All the expected motifs are present, including dragons, flowers, birds, crabs, and other animals. In later centuries, a Russian influence became more pronounced. Virtually every Caucasian rug is crafted using the symmetry of the Turkish knot.